When it comes to computers, system stability testing is a way of measuring the “health” of your PC. This is usually performed by individuals like computer technicians. And you shouldn’t run these tests frequently as it involves putting a lot of stress on your hardware and can do some damages. But as said, in some occasions it can be quite useful for things like locating the faulty hardware. Under platforms like Windows we have a lot of both free and paid utilities but in GNU/Linux there aren’t that many around. 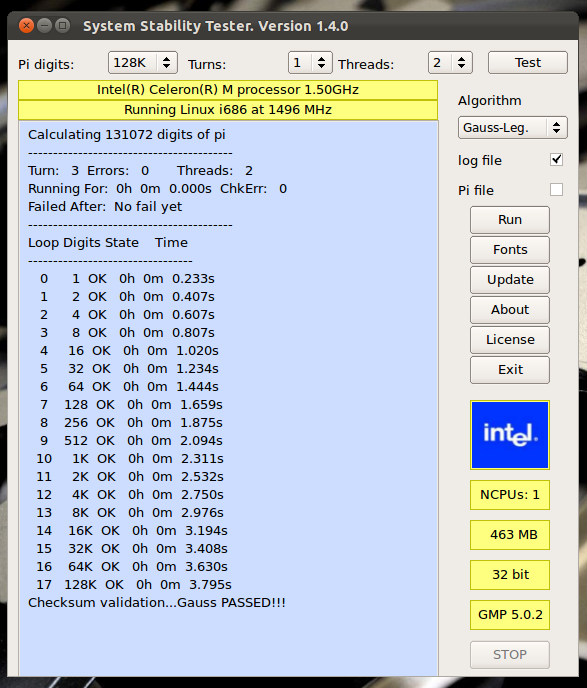 In that case, as a GNU/Linux user if you’re searching for a CPU based system stability tester and a benchmark tool (originally developed for CPU “over-clockers!”) then you should try “systester”. This open source tool also supports Windows and Mac OS X too. But as mentioned in the title, this is a simple utility that puts stress on your CPU mostly (including RAM too) and you cannot use it to test other hardware such as hard disk drives etc. So please remember that. *. 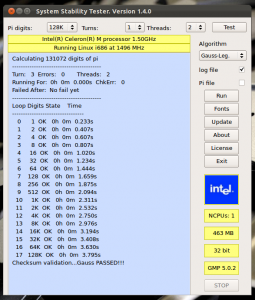 Stresses your CPU by using Pi (“π”) based calculations up to 128 million bits (you can also manually load a “Pi” file too). *. Supports up to 32 threads. *. Runs up to 50 times. *. Gives you warnings if anything goes wrong (useful for isolating hardware related issues) and hashchecking. *. 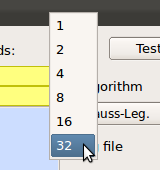 Supports both “Borwein” (an algorithm that calculates the value of “1/π”) and “Gauss-Leg” algorithms. *. Shows some of your hardware details such as: CPU type, manufacture, OS and installed RAM etc. *. Save output to a log file (disabled by default). *. Manually “Stop” the benchmarking process.. are some of its main features to mention. You can install “systester” in Ubuntu 12.04 Precise Pangolin, 11.10 Oneiric Ocelot, 11.04 Natty Narwhal, 10.10 and 10.04 (as long long as you have Qt 4.4 or never) by first downloading the zipped file from this “systester” home page (it includes packages for other OS platforms too). If the download section confuse you, under “Linux i686/x86 binaries” just look for a package called “Generic Build” simply click on it to download. Then simply extract the content to somewhere (say to your desktop for instance). Then go into that folder and locate a file called “systester” and simply double click on it and it should open up the program window!. This is the best thing about “systester”. You don’t have to install, just extract the content and you’re good to go ;-). That’s it, good luck.